→How To Catch Largemouth Bass – It’s Surprisingly Easy! 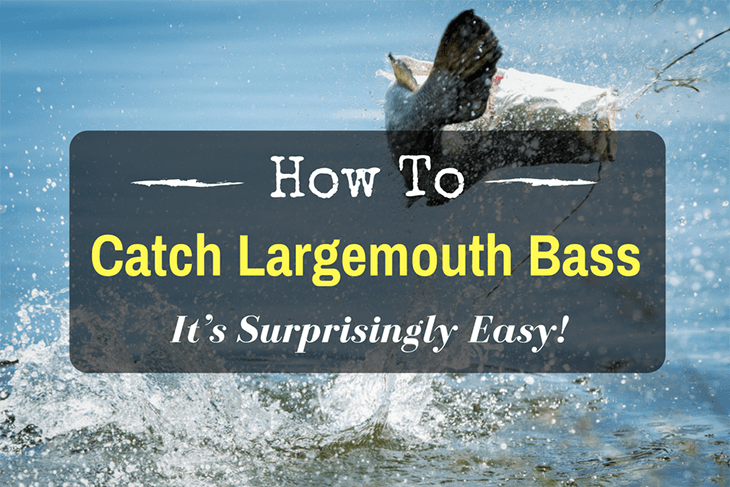 How To Catch Largemouth Bass – It’s Surprisingly Easy! Largemouth Bass are one of the most popular targets for fishing throughout the United States, as well as in other countries abroad. 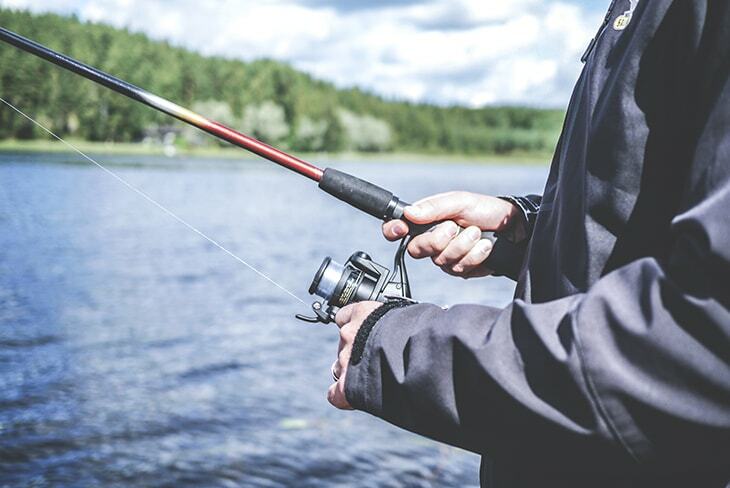 As a matter of fact, every single state in the US, save for Alaska has bodies of water wherein this particular species of fish thrive, making it the most popular one for those who are into fishing. This popularity is brought about by its abundance, as well as its size. This species of fish is exponentially larger than other kinds in terms of its weight, and thus it is indeed, a moment of pride whenever fishers catch this type of fish. In terms of the weight of this bass, the largest one ever caught on record is at 22 lbs. On an ordinary day, however, bass caught could weigh as little as 2 lbs. while females generally soar higher, weight-wise at 6 lbs. onwards. The weight of these fish is greatly valued, hence there are several competitions which aim for fishers to catch the largest size possible. If you are a beginner you would want to know how to catch largemouth bass, the best largemouth bass lures, etc., then we have the list for you. These two go hand-in-hand, basically. When it comes to catching largemouth bass, you have to always put the strength and thickness of the fishing line you would be using, as well as the smoothness of the real. The thicker the fishing line, then the greater the chance of your getting a heavy catch without snapping the reel or the entire rod. If your place is not known for having heavy largemouth bass, however, the thinner, more sensitive ones would still most definitely be strong enough to hoist the catch-up. For extra heavy catches, it’s best to select a 50 lbs. braid with a leader of 30 lb​s. You have the option to go lower, especially if your place is not known for having the heaviest of largemouth bass. This is definitely one of the essentials you have to keep in mind whenever you go out to fish, as this is where you'd hope the fish would bite into when lured with the bait. Afterward, you'd then hoist the fish towards you the moment they get to bite down on the hook. There are several kinds of fishing hooks, each of which varies in terms of structure. The most important factor you have to consider would be the style of the hook point. Always make sure that it's sharp enough to penetrate into the fish. Make sure to avoid thin wire hooks and the thick wire types as these are not rigid enough to penetrate into the cartilage of the mouth of the bass. 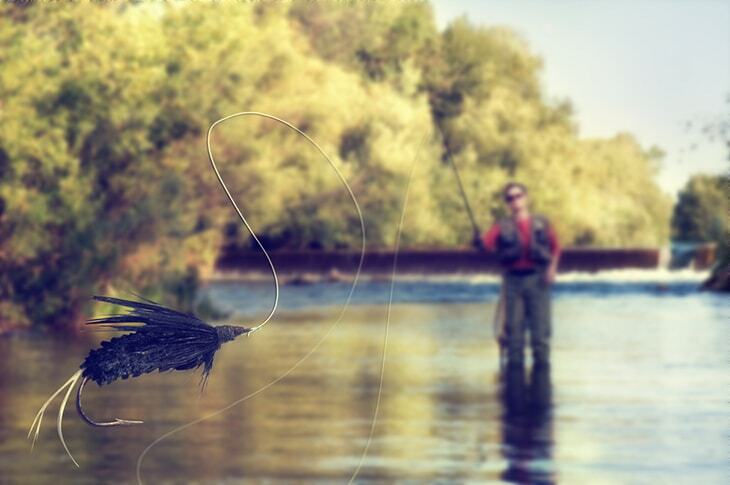 Make it a point to choose a relatively smaller size for the barb. Common point kinds include the rolled-in point, surgical needle, spear point, and the hollow point. When it comes to capturing bass, the best kind would be the knife edge, which characterized by having a flat inner surface, that’s flattened with grounded sides. Another characteristic of hooks you have to consider is the hook shank, with the regular style being commonly used for bass fishing. Other kinds, like the long, and curved and offset varieties are great as well, but you have to consider the kind of bait you would be using, as different shanks suit different kinds of bait. While Bass are basically there, alive and swimming in the waters the whole year round, one of the ways in order for you to make sure that you're going to be guaranteed of a good catch is to know the right season for catching, apart from securing a fishing line and rod, as well as the best largemouth bass lures. 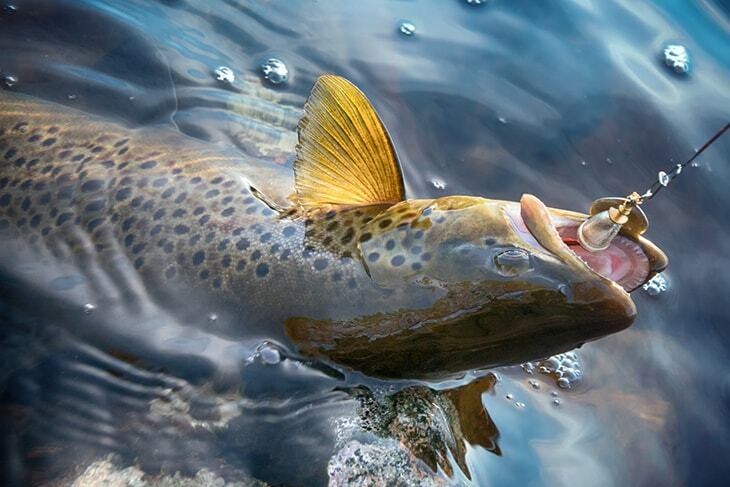 The spawning season is the best time for you to catch these fish, as the males usually come to the shallow parts during this season, and the females are much more vulnerable than they are during other seasons. The spawning season for largemouth bass is in the spring, and this greatly varies from state to state, but one thing's for sure, and it's that it happens between the months of March and May. The spawning season is the period when the females go and look for a place in order to lay or deposit their eggs, with the males looking out to be able to fertilize it. 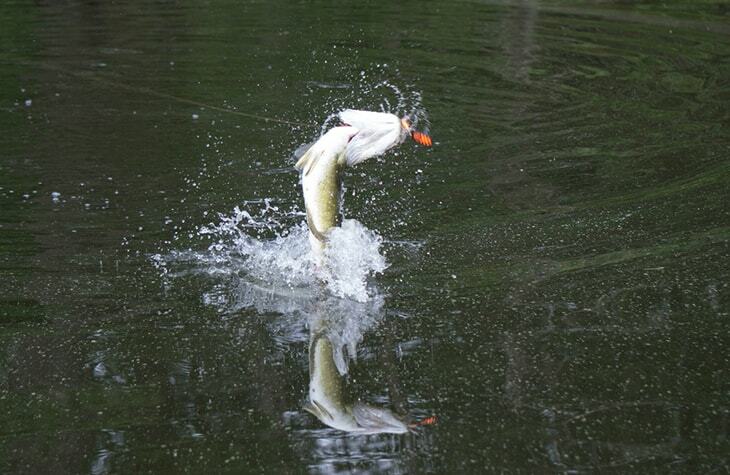 This is one of the major activities in a bass' life or other kinds of fish for that matter. This activity makes the fish move a lot more underwater, as they seek for places to lay eggs, and thus gives you a better shot at getting a good catch, better than you would when fishing in other seasons throughout the whole year. The good thing about this largemouth bass is that given their large mouths, it would be easy for fish to get a hold of the hooks you can use. The reason for this is simply because this kind of species is aggressive in nature, and would thus bite or attack at the site of something that’s unusual that’s lurking in the water, or would pounce on things that resemble animals or food that’s part of their diet. 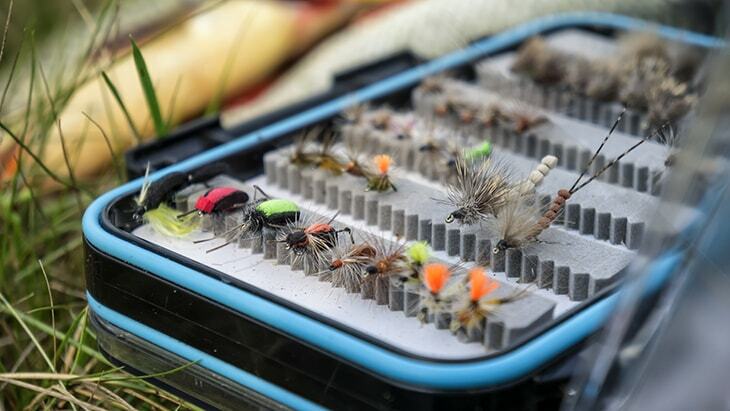 The best trout fishing lures, therefore, could practically be anything, from small plastic worms, to fly, so on and so forth, and thus determining the kind of fishing lure to use is something that isn’t really difficult. Despite the wide range of lures you can use to capture largemouth bass, the best largemouth bass lures would depend on where you are fishing. This is because you would have a better shot at capturing lures if the bait you’d be throwing into the water is one which is already familiar with them. When it comes to how to catch largemouth bass, the methods employed would most definitely be dependent on the kind of lure you have. Having said that, below are the various strategies for fishing based on the common lures used in doing so. Apart from the fishing apparatus, you should also know how to properly use these. Moreover, it’s also best in order for you to get a hold of personal apparatus, such as a jumper, as well as gloves to get a better grip on the fishing rod. Lastly, keep in mind that being good at catching largemouth bass is something that takes a lot of time, patience, and practice. As previously mentioned, the method through which these largemouth bass are captured is determined with the use of Largemouth Bass Lures (Here is my review of top ten bass lures). Having said that, there is not a single kind of approach. Below are things you have to remember whenever you use various kinds of lures. This is the most important, and most obvious thing you have to keep in mind whenever you go out to fish. Always remember to bring with you the best largemouth bass lures, as well as the right thickness of lines, and most importantly, a rod that's strong enough to support the relatively heavy weight of this largemouth bass. No matter how well-executed your angling and fishing techniques are, it just would all end up being futile if one of these materials would fail. 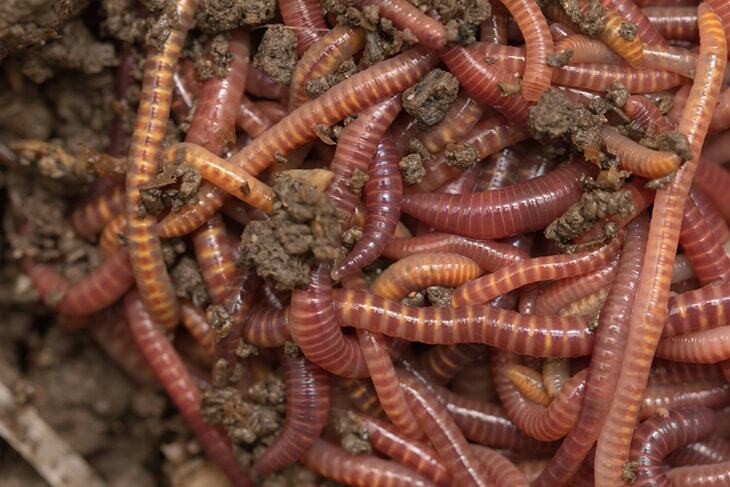 The methods used in fishing to be discussed below include largemouth bass lures such as drop shots, swimbaits, top waters, plastic lizards and/or worms, as well as senkos. If you plan on capturing largemouth bass using drop shots, the first sting you have to do is to secure any plastic lure of your choice and tie it to the line using the special drop-shot knot. Always maintain a constant but light pull so that you could determine if there is a bite, no matter how subtle it is. Allow it to jiggle a bit, and then let it rest. Make sure that the drop shot is the same color as the fish surrounding the area. This fishing technique is popular in the southern parts of California, and is used primarily to capture larger varieties of fish. These swimbaits have sizes of as small as 6 inches, to twice as big as that. There are floating types, and there are some fast-sinking ones as well. When it comes to casting these, you have to be as patient as you possibly could, simply because it would take a long time for bass to generally grab a bite of this. Just be wary though, and make sure to select a swimbait that’s as realistic-looking as possible, and one which would move just like any other real living fish would. 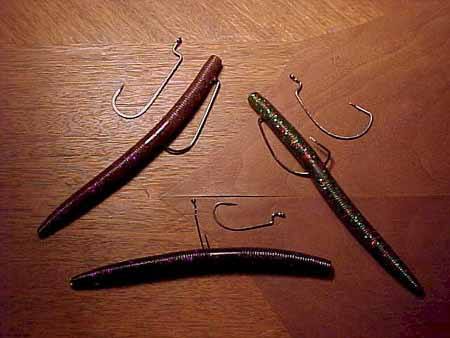 Among the kinds of largemouth bass lures, this is the one which has a seasonal aspect as to how it works. Specifically, it’s best to fish using this lure during hotter months, either before sunrise or after sunrise. It’s best for areas that have a lot of sea plants. Just like swimbaits, getting a good catch would take longer if you make use of topwater baits, but in times when the baits are active, it’s going to work out much quicker. 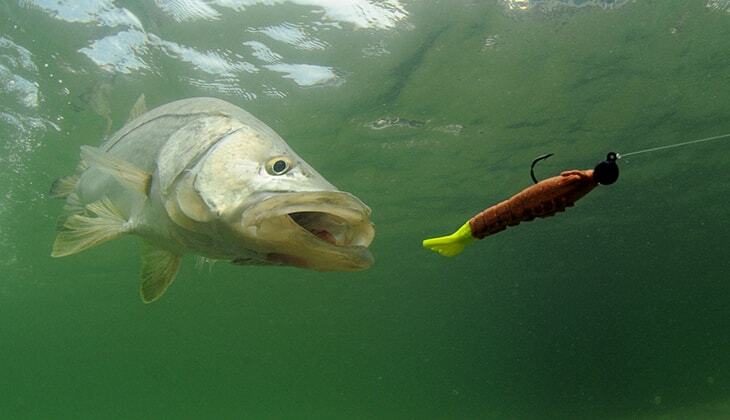 This is one of the most classic, yet the most effective type of lure there is in the market for bass nowadays. This is because all are lightweight, and therefore, sink to the bottom at average speeds. The moment it hits the bottom, it's best to wait for a little bit, and with the rest of the line, let them slither a bit in order to move it from place to place on the floor. Once you start to feel that the reel has moved a bit, or if you feel something unusual on the line, reel the slack in, and have the hook set. 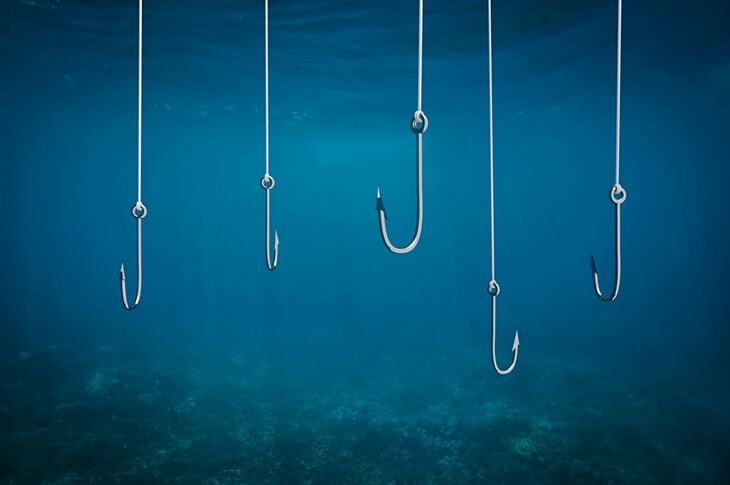 One of the major advantages associated with these kinds of bait is that they often come across as something that's natural for them, and thus they would hold on for it for a longer period of time rather than immediately spitting it. Just like other kinds, however, capturing this would take rather too long for them to strike, so it's best to utilize a hook that's barbless. The last of these kinds of lures are senkos. These are the easiest to use for fishing purposes. The reason for this is that you may see the line move off easily. This is a disadvantage, however, whenever you get to use it on windy says, as it would be difficult to detect movements from being bitten below. Just wait and let it sit patiently if you want to use it. It is also ideal for fishing in shallow waters because of this. Did you enjoy this tutorial? In a nutshell, how to catch largemouth bass all depends on the largemouth bass lures you are to use. 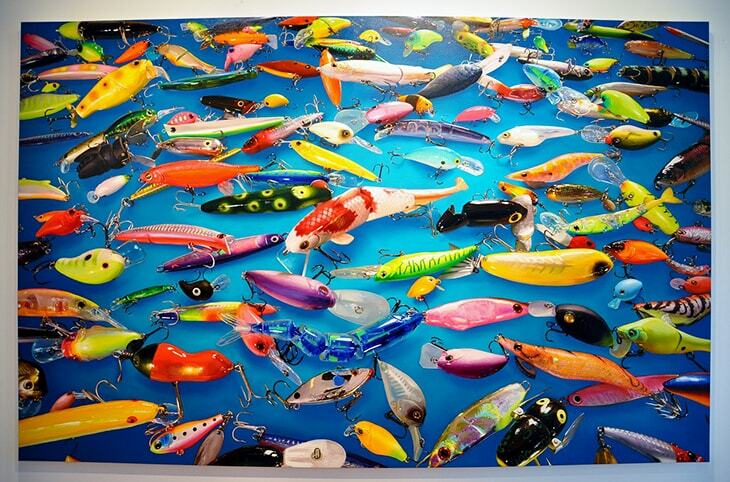 Different kinds of lures would mean different means of effectively handling the other materials. Furthermore, different lures have different means of sensitivity, with some of these taking longer to effectively catch the bass from others. Moreover, if you're a newbie in the world of fishing, it's important to keep in mind that you have to start with the smaller varieties of bass first, given that these are easier to catch. 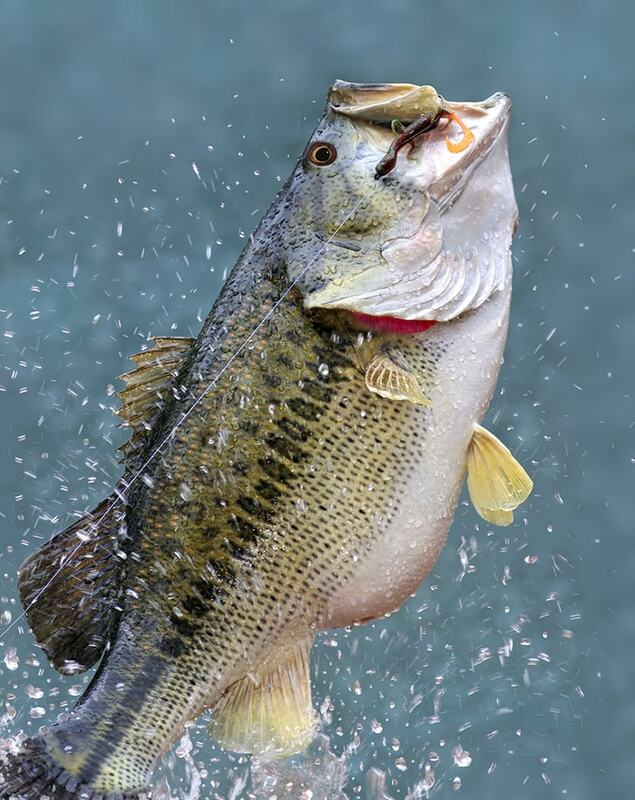 Don't be discouraged if the bass that you capture on your first try is smaller than expected, or if the bass would manage to spit the lure you have tossed into the lake or river, eventually causing this bass to escape. As mentioned earlier, it takes time, persistence, and effort in order for you to be the pro bass catcher that you are aspiring to be. If you have learned a lot, feel free to share this tutorial with your friends and other people who want to know how to fish using largemouth bass lures.